Xu Zhiyong appeared in the Chinese edition of Esquire in August 2009, while he was being detained for alleged tax evasion. 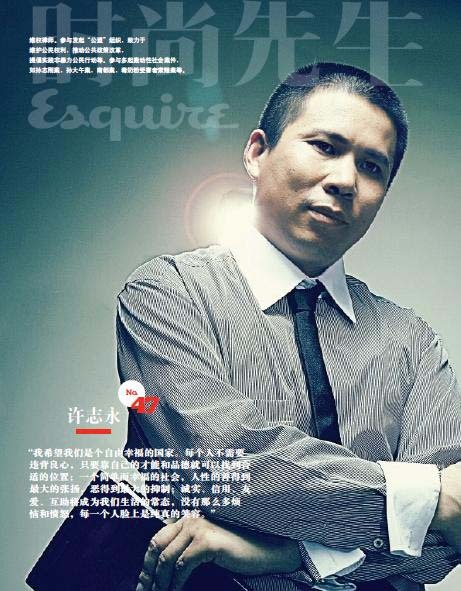 Rights defense lawyer Xu Zhiyong has continued his advocacy despite years of setbacks. The Open Constitution Initiative, a legal assistance NGO he and several other lawyers founded in 2003, was shut down in 2009 by Beijing officials, citing tax evasion. After writing a blog post about the New Citizens’ Movement last May, Xu was detained overnight. In the run-up to the National People’s Congress this February, Xu was one of 100 signatories to an open letter to the Chinese government calling for the ratification of the International Covenant on Civil and Political Rights. Xu was put under house arrest during the Congress. He lectures at the Beijing University of Posts and Telecommunications, but has been barred from teaching because of his activism. In an April 12 blog post, Xu describes how the police pulled him from a flight to Hong Kong and questioned him about the New Citizens’ Movement and public dinners he has helped organize to discuss issues of civil rights and democracy. Both this blog post and his April 23 essay on the New Citizens’ Movement are translated below. On April 12, I was on my way to Hong Kong to participate in the “Symposium on the 10th Anniversay of the Sun Zhigang Case” at the invitation of the Chinese University of Hong Kong and Teng Biao. I went through border control waited for my flight. “See you this afternoon,” I told Teng. As we started boarding, three policemen suddenly appeared and asked if I was Xu Zhiyong. I said yes, and asked if they were there to stop me from boarding. They said yes. They didn’t know why. There were people waiting for me outside. When we got to the College of Humanities, Z told me to leave my bag and go upstairs. I firmly resisted. I wasn’t afraid that they would find anything to use against me. Everything on my laptop can be made public. But that’s my private information, and I was concerned that they would install something on it. I bolted out of the car. They ran after me, right in front of the classrooms on the ground floor where students could see. I want to tell the students that this is something that happened in today’s China. Concerned that there were too many people around, they promised not to take my bag. I went to my office on the third floor, closed the door, and called my family. The college Party secretary started knocking at the door. The Party secretary told me that my college salary had been suspended as of March. I said I understood and would consider writing a resignation letter. My teaching credentials were revoked in 2009, but I was willing to stay because I hoped that I would still have the opportunity to teach. However, this system cannot tolerate a true idealist. The salary suspension was a result of direct pressure from the Ministry of Education. The excuse was that I hadn’t been going to work for some time. That was when my freedom was illegally restricted and I could not leave my house. I told the Party secretary that they were going to illegally seize my bag and asked him to help me hold onto it. He refused. I left the Party secretary’s office and was taken to the campus security office. I know that Chinese universities lost their basic independence and dignity long ago. In an isolated room, five people seized my bag. For the next few hours, I was alone with my thoughts while they chatted in the next room. They ordered McDonald’s. As usual, I didn’t eat anything. In the mean time, Z came along and asked to make a written report. I said there was nothing much to say, but he insisted. Q: What are you going to do about black jails? A: As long as there are illegal detentions, like what you did today, I will continue to surround and watch. Q: What are you going to do about financial disclosure? A: I’ll continue to strive for it. How can you fight corruption if you don’t even dare to disclose your personal assets? Q: Will the citizens’ city-wide dinner parties continue? A: Yes. We will be citizens with pride and dignity. Q: How many people attend your dinners? A: Not sure. Everybody can be a citizen. Everybody can attend or leave at any time. In the end I asked him to add that “I solemnly protest the Beijing Municipal Police Bureau illegally restricting me from leaving the country, illegally restricting my personal freedom, and illegally searching my personal belongings.” He didn’t add this. I refused to sign. They took the written report away. After 10 p.m., Captain C came in. We’ve had many conversations before. C: In the past, you worked on individual cases to protect people’s rights. Wasn’t that pretty good? For example, you helped appeal the Chengde case. But now, this New Citizens’ Movement. In the past ten years, especially the last year, the there have been dinners everywhere. The nature of the movement is changing. Me: The unjust Chengde case happened 19 years ago. We have been working on the appeal for 10 years, but no settlement has been reached. While we worked hard on individual cases, more and more injustices emerged. This is essentially a problem of the political system. From individual cases to the New Citizens’ Movement, we followed Heaven’s will. And to some extent, you forced us. Before March of last year, we had a fixed office. Every day we had at least one person available to receive petitioners. I would go there twice a week to read their documents. Perhaps there were many cases we could not handle, but at least we could offer some advice. We spent a lot of time doing this concrete work. But after March, you shut down our office. A lot of underprivileged people couldn’t find us. We shifted the emphasis of our work to promoting people’s awareness of their identity as citizens. Actually, the nature of our work hasn’t changed at all. We have always been pursuing democracy, rule of law, equality, and justice. In the past we worked more on being citizens ourselves. Now we advocate that everybody act as citizens. More and more people want to be citizens. What are you afraid of? C: Where does your theory of “new citizens” come from? Me: Inspiration from above. Specifically, inspiration came to me around May last year while I was reading at home. I believe that all inspiration that drives the work of human beings comes from above. C: Do you know the theory of the “small circle”? Do you know Li Yiping? Me: I know of this theory. I heard about it in the past few months. I don’t know Li Yiping. The dinners are not “small circles.” They are open to all. We who share an identity as citizens meet to discuss common issues, and together push forward democracy and rule of law in China. C: What’s the purpose of New Citizens’ Movement and the dinners? Me: For citizens to work together to push forward democracy and rule of law, and ultimately to make China a country of freedom, righteousness, and love. C: Does democracy imply overthrowing the Communist Party? Me: There are no such concepts as “overthrow,” “knock down,” or “enemies” in our system of thought or our discourse. Democracy implies people having the right to directly cast votes and elect officials and legislators at all levels of government. This has nothing to do with overthrowing anyone. If the Communist Party is capable of transforming itself like the Kuomintang and winning an election, we will definitely support that. What we pursue is true democracy, China’s peaceful transition to constitutional government. Whether the Communist Party can transform itself and win elections is your own business. We don’t entertain any fantasies about that. But we harbor good will towards every Chinese person. C: You and I have known each other for years. I believe that you are a pure idealist. This is the reason we have been relatively polite to you. But do other people in your group, like Zhao Changqing and Ding Jiaxi, think the way you do? How do you control other people? Me: I am quite selective when it comes to my close friends. Zhao Changqing and Ding Jiaxi are both model citizens with moral characters and pure ideals. The “citizenry” is a group that is open to all, a coalition of free citizens which offers no hierarchy or material gain. Nobody can censor others. We cannot exclude people who have bad characters. We don’t even know if anyone was sent to us by you. We don’t care. But if someone does seriously immoral things under the banner of freedom, righteousness, and love, I may publicly criticize him or her. It might have some impact on the person, but that isn’t control. It’s normal for citizens to disagree with each other. We resolve discord through democratic rules. What we are pursuing is ultimately the establishment of a system of democracy and rule of law. People will bad characters will be controlled by the law. C: Some among you are extreme. Are you able to control them? We have solid evidence that those four people advocating financial disclosure gathered illegally. How could you possibly say you are not responsible for that? Me: Citizen groups all around China are evolving independently, and act autonomously. I can only influence others, not control them. As for the four gentlemen detained for promoting financial disclosure, of course I am responsible. I initiated the movement. Although strategically I don’t agree with their particular method, their action was just, and anything but illegal. I’m responsible for following in their steps. If they are guilty, I ask for the same treatment right now. C: I’m puzzled. You were always a good student. Your family wasn’t persecuted. You’ve been successful in school and in your career. You could have lived a good life. Why did you choose this path? Everything has a reason. What’s yours? Me: You think everyone lives for himself or herself. Only when we suffer injustice ourselves do we fight back; only when something unfortunate happens is the orbit of our lives altered. This logic doesn’t suit me. I could live a comfortable life under this system, and I don’t feel that I have ever been persecuted. Every time my freedoms have been illegally restricted, even when I have been beaten, it was because I stood up for someone else. This is a responsibility I ought to bear. But in this country, the autocratic system is the root of so much injustice and so much pain. Autocracy must end. Nothing happened when I made up my mind in the ninth grade. The radius of my life was no more than ten kilometers at that time. So I believe in destiny. If we have to find a reason, it is the destiny of a people which has gone through immense hardship, and which will find nirvana in a new life of freedom, righteousness, and love. This is the reason why I came into this world. At 11 p.m., they said they would send me home. I wanted to go home by myself, but they forced me into their car. Outside the corridor, they didn’t leave. I don’t know how long will I lose my freedom for this time. I know that as I carry on, the price I have to pay will only grow. But someone has to take this on for the progress of our people’s modern civilization. A group of citizens has already stood up. In an autocratic society, the path of striving to be a good citizen is a long one. I have come to some understanding in recent years of what this path entails–service, duty, and letting go. I write this to encourage myself as well as my friends. Service means serving society, helping those who need help the most through actions. Every place has its own social problems: domineering, corrupt officials; chengguan who beat people; a polluted environment; injustice; land grabs; and arbitrary fines and illegal charges, to name a few. We need to cast our attention downwards, sincerely care about the underprivileged, and help them protect their rights and interests. Citizen groups should do things that offer genuine help to the people. Only if we help many, many people can we take root in society and gain broad support, so that we can promote the development of a democratic and constitutional government in China. Politics should serve the public. At present, there are a lot of opportunities to serve the people in China. We need to look for them carefully and invest in them with devotion. Tomorrow’s democratic politicians are today’s pro bono representatives. Politics is not empty talk. Politics is not opposition for its own sake. Politics is a noble career that serves the interest of the public. Politics is in our daily life. Our fundamental strength is not measured by how politically calculating we are, but how many things we have done and how many people we have helped. Demanding financial disclosure of officials, pushing the Standing Committee of National People’s Congress to pass the International Covenant on Civil and Political Rights, surrounding and watching Attorney Wang Quanzhang’s detention and other public incidents, all serve society. Reposting the truth about events online and spreading the ideals of democracy and rule of law also serve society. While paying attention to the general direction of our country, we ought not to neglect the people and events around us. Citizen groups should work hard to be recognized as good people by the public in their communities and cities. There are many things to do in this time of change. Fierce action has its value, but it is neither possible nor necessary to have everyone at the vanguard. More people should serve society in down-to-earth and practical ways. In all, we should do work and thrive through our actions. Duty means courageously taking on responsibility. In the pursuit of freedom, righteousness, and love, in the transformation from subject to citizen, you might “drink tea,” be harassed, have your freedoms illegally restricted, be fired from work, or even be beaten and punished as a criminal. But there have to be people who pay the price for the progress of society. Many of our predecessors have shouldered enormous responsibility. Some of them spent decades in prison, and others, like Lin Zhao, sacrificed their lives. Today, we still need to make sacrifices to push forward social progress. Although we have generous hearts; although we pursue a noble career of freedom, righteousness, and love; although our actions are temperate and reasonable, the move from subject to citizen is, by nature, dangerous. Some people take the lead for social progress. Once they take the first step, they cannot go back. We respect those warriors who fiercely challenge the system. But we do not need everyone to be at the forefront. We hope that everyone takes responsibility according to his or her own capacity. Some citizens within the system can also take on responsibility in their own way. If a person does not have too many family obligations, is psychologically prepared, and is relatively well-known, then he or she can take on more. If someone has a heavy family burden and is not that well-known, I suggest that he or she start with smaller, less sensitive tasks; for example, individual rights defense cases, environmental protection, charity and public welfare, etc. The New Citizens’ Movement is a huge, historic change. We should move forward with perseverance and peaceful minds, avoid the impulse to act radically, and not let setbacks defeat us. Letting go means forgoing the ego. Most people who pursue democracy and freedom have a strong personality. The positive side of this is that they are courageous and persistent, while the negative side is that they cling to their own ideas. Some of them even regard themselves as elders. They talk endlessly during our dinners, while others cannot squeeze a word in edgewise. Instead of going through the democratic process, they act according to their own will. If one utterance rubs them the wrong way, they think it is a conspiracy and try to undercut the speaker–to the point that the doors for us to open multiply, the mountains for us to climb stand like a forest, and our group is factionalized. We pursue freedom, but that does not mean we do not have responsibility. Only when we unify our strength can we achieve true democracy and freedom. Only when we let go of our obstinate egos and follow democratic rules can we achieve unity. No matter how senior you are or how much you have accomplished, at citizens’ dinners we sit as equals and speak as equals. When we disagree, we can engage in public debates and resolve them by vote. It does not matter if you are a reformer or a revolutionary. We can have different methods to pursue democracy and constitutional government. We should coordinate with each other while preserving our own beliefs, but we should not attack each other. If some people in our community of citizens does something wrong, we should criticize them if necessary, but always maintain good will. Ultimately, letting go means forgoing personal interests, social status, and prejudice. Modern politics is a noble career of idealism. We do not pursue democracy and constitutional government for personal gain or social status, but to realize our dream–to make China a country of freedom, righteousness, and love–to promote the progress of human civilization, and to fulfill our mission on this earth. To those who think politics is a filthy shoal whose sands we may sift for profit, I suggest they keep away from modern politics. In an ever more transparent, modern, and civilized society, a person’s image is accumulated through time and action. There is no need to overemphasize temporary gains and losses. By serving society, taking on responsibility, and letting go of ego, strength will naturally grow. Service, duty, and letting go; each is harder to accomplish than the last. Many can serve society, but as soon as they encounter resistance, they might retreat. This is understandable. Each person should take on responsibility according to his or her capacity. The most difficult of all is letting go. We all have our selfish instincts. But to fulfill our responsibility, we must let go of our egos as best we can. This is a continuous process of self-reflection and self-cultivation. Democratic elections and the system of checks and balances are of course more essential forces; but the strength of personal morality within the community of citizens will directly influence the progress of democratization and, in the long run, the quality of the newly-born democratic system. Service, duty, and letting go; this is a never-ending process of personal cultivation, and it is the continuous union and growth of the force for democracy and constitutional government. Li Yiping, an activist living in the U.S., theorizes that the pro-democracy movement in China can organize itself through interlocking “small circles” (小圈子), building a social network that is “formless” and therefore difficult for the government to track. Li has written about his “small circle” theory at Boxun [zh] and Beijing Spring [zh]. Back. After losing the Chinese Civil War to the Communist army in 1949, the Kuomintang (KMT) perpetuated the Republic of China and martial, one-party rule in Taiwan. The KMT began allowing new political parties to form in the 1980s, and by the 1990s competed among the Democratic Progressive Party (DPP) and other parties in free and fair elections. Back.